“Sharing is caring” is not a popular mantra in the animal kingdom. When your dog was a newborn puppy, she may have had to compete with her siblings for the milkiest teat. If her litter ate out of a single bowl, she may have learned to eat fast and be on-guard during mealtimes to ensure she’d get her fill. Now that she lives with you, she doesn’t have to worry about competition. She gets her own food and her own treats. But she may still have an instinct to guard her food with growling and aggression. She may have gradually developed food anxiety while living with you. Sometimes, it’s unclear why dogs act this way. As a dog owner, you need to be able to get objects away from your dog, no matter how tasty or valuable they are to her. If her toy breaks while she’s playing, you need to take it away before she chokes on a small broken piece. If she finds something dangerously delicious on your walk, you’ll need to get her to “drop it” so she will not get sick. If your dog is showing these signs, she is already feeling anxious about you taking her food away. She’s communicating to you in the best way she knows how. If you scold your dog for growling or showing any of these signs, you will be cutting off her only way to warn you. She’ll still feel anxious, especially when she’s unable to communicate with you. By no fault of her own, her survival instincts and building anxiety will cause her to BITE. So, never punish your dog for growling at you. Never scold her for trying to protect her food. When your dog growls, the best thing to do is back off. Give her space, and let her cool down. Don’t try to take her food away. Let her finish eating in peace. You’ll need to work to prevent food aggression when she’s calm. 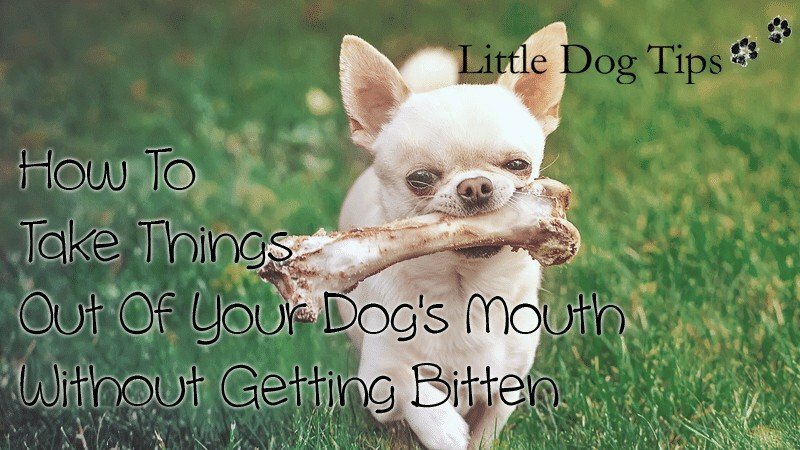 Not when you suddenly need to get something out of your dog’s mouth. There are situations in which you cannot simply leave a growling dog to eat in peace. Like when your dog knocks the Thanksgiving turkey to the floor, and is devouring all 23 pounds, growling up a storm when you come near. Cooked poultry bones are splintery and can kill your dog. So, this would be a dire situation. A dangerous one. It’s hard to even advise you on a situation in which you’d have to get something away from a dog who is already food aggressive. So many things could go wrong. You could make the aggression worse, or you could get bitten. My suggestion is to find any way to get the dog away from the object without scaring her further. This is best done as a team. One person can distract the dog, while the other grabs the object. The distraction shouldn’t be scary. The “distractor” on your team can ring the doorbell, or even run around in the next room making silly noises – anything to evoke the dog’s curiosity and get them as far away as possible so you can safely remove the object. Sometimes, all you need to do is praise your dog, and call them to you. Keep your tone happy and relaxed. They might just listen. That’s it. Never, ever try to take something away from a growling dog for any other reason. It’s not worth it. If your dog stole your ham sandwich, and growled when you tried to get it back, forget it. You’re out a sandwich. Let it go, and work on this issue later. Every time you feed your dog, have her sit politely and wait until you tell her it’s okay to eat. This helps your dog recognize you as the food provider. It also teaches your dog to wait for your approval before eating anything. Here’s the Pre-Meal Ritual, step by step. Stand, holding your dog’s bowl near the feeding area. Be still if your dog is hopping about, jumping on you, or doing anything other than sitting. At first, you might need to tell your dog to sit, but as she picks up the routine, wait until she sits by default. Set the food down slowly, but only if your dog remains seated. Say, “eat!” and, only now, allow your dog to chow down. Once your dog learns “drop it,” she’ll drop whatever’s in her mouth. Even if it’s very tasty. When your dog is holding a toy in her mouth, offer her a treat. Praise her (or click) the moment she releases the toy. Give her that treat. Then, give the toy back and start again. Instead of a toy, give her a low-value treat, or kibble. Offer her something high-value, like a small piece of chicken or hot dog. Praise her (or click) the moment she releases her low-value treat. Give her that high-value treat. Practice with escalatingly tasty things, and practice often. As often as possible, give back the item your dog releases. That way, she won’t think you’re always going to take things away from her forever when she drops them. Dropping items should always be a good and rewarding experience for her. If your dog becomes aggressive with a certain type of treat or toy, you may want to avoid giving it to her in the first place. Long-lasting chews like pig’s ears can promote aggression because dogs take a long time to finish them. They can get overly attached to their chew, and may be unwilling to give it up after spending hours obsessively gnawing at it. 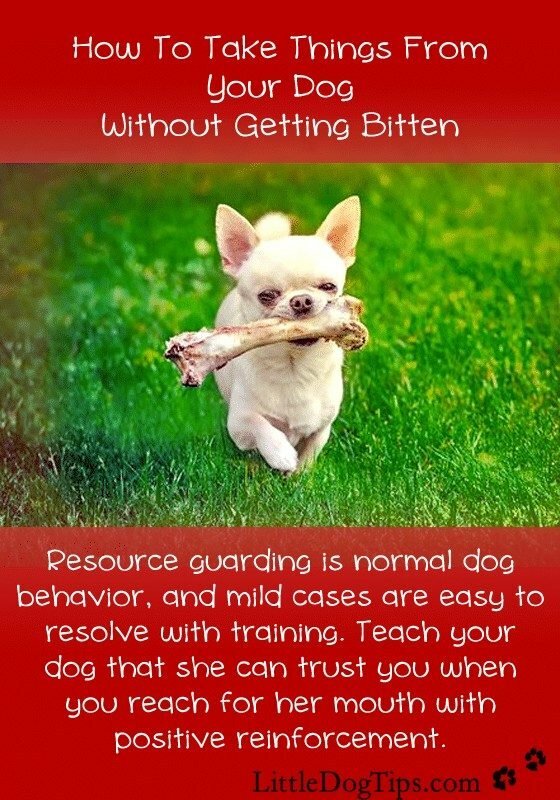 You can also, very carefully, counter-condition your dog to look forward to, not fear, your presence while she’s enjoying something she feels the need to protect using Patricia McConnell’s approach to treating resource guarding. Set up a situation where your dog is likely to be food aggressive. Give her that coveted pig’s ear, then leave the room to stock up on high-value treats. From across the room, toss high-value treats at your dog. You should be so far away, that your dog does not even stiffen. Gradually get closer to your dog – but don’t get close – tossing treats to keep your dog loose and comfortable around you, even as you get closer to her and her pig ear. Any sign of her stiffening up, you’ll need to step back and try again later. When she is no longer anxious to have you around her while she’s chewing, carefully, gradually offer her treats as you reach towards her pig ear. Do NOT rush this. If you go too fast, her anxiety and aggression could come back full swing, and you can get bitten. That would be a terrible experience, and the trauma would only make the problem worse. When your dog allows you to pick up her pig’s ear, give her a treat, then give the ear back. She will learn that she can trust you, because you’ll usually return her prize. You should practice having your dog “drop” objects, even if she has never showed signs of food aggression. As often as possible, give her object back to her after taking it. This builds trust in the relationship between you and your dog, and helps balance her animal instincts with the understanding that you always, always do good things for her. Should You Say "No" To Your Puppy? When we first got Zoe she displayed some resource guarding towards our cats with high value items like bones back then I didn’t know as much as I do today and we made the mistake of taking the bones away and telling her off. We ended up punishing the growl out of her and we’ve had to deal with that. She does not give much warning now when she’s feeling guardy and that’s usual when she’s anxious about something. We don’t punish her at all and use as much management as possible to prevent guarding. She does not guard against people, just other dogs and my cats and it is very, very mild. I’m hoping one day she will be comfortable enough to make noises again. We are lucky that the other animals in our home have learned how to read her and are very respectful if she’s in a mood. It seems so much tougher when the guarding is happening between two animals! Good advice! The cat’s don’t like sharing either. These are great tips and will help people to work with their dogs! We’ve adopted so many rescued dogs and what we’ve found is that there are two general types: resource guarder or super passive. We always feel for the resource guarders because it makes us wonder what happened to get them to the place they are at. Your tips are fabulous and will help – we always keep some doggy dinner in our hands just in case we need to make a ‘trade’ with one of the pups in order to keep things safe! What great tips for food reaction. I have always pet and interacted with my dogs while they eat so they are used to my touch and know that I won’t take their food. Now, treat bones are a different thing. Those call for diversion. Those are wonderful tips. My dogs don’t guard against me, but they do resource guard against each other, especially something like a bully stick. So they only get those when they are in their individual crates. I hope one day I won’t have to do that. Fortunately, they are all of similar size so it isn’t as dangerous as it could be. Kilo guards like a lion so we work on all your points- great tips. He can now do a very good wait and he will always trade happily after much practice however he does not like drop once he has something. I leave bags of treats around the house as he has stolen chewing gum, dirty tissues, socks etc. If we catch him then we trade. Kilo is so lucky to have such a patient family! We do a lot of trading up in our household as one dog resource guards. Great piece. I’m thankful that we haven’t had to deal with much of this Bentley is a little possessive of his food, but he also understands that I gave it to him, so if I come near he expects me to give him more, not to take it away. I definitely need to work on “drop it” though. hey there! checked out your wistebe and am very interested in your assistance. We have a year old lab X greyhound (so we found out afterwards!) and all in all he is an amazing dog, we got him at 8 weeks and he has been around our daughter who had just turned 3 and is amazing with her she lays on him..pushes him is kind of in an agressive stage right now and we try really hard to stress to her NOT to be like that lol but anyways he has never growled, snapped, bit or snarled at her..or anyone for that matter.. he is a very loving and affectionate, licky/kissy dog.however, we have a baby on the way, and my husband was just called into the military and will be going away for quite a while. Bentley(dog) seems to listen to my husband more than me they are BFFS. And Bentley has and always has had an issue with jumping up, and pawing at people lol not aggressively but its still super frustrating, and we are concerned with the baby on the way and such and just want to get him under control while hes still young.Let me know what you think and We’d love to meet! When it comes to jumping and pawing, Bentley just wants attention. So, you have to show him appropriate ways to get attention – by sitting instead of jumping, and you can also work on teaching him to bring you and your guests a toy. All in all he sounds like a great dog! It’s good that you’re working on this now, while she’s little, and it’s also a good time to think about working with a professional trainer or behaviorist if you haven’t had much luck with the above steps. In the meantime, you can practice asking her to drop things that she is not protective over. When she’s refusing to give something up, it doesn’t help to scold her, as you’ve learned, but it can help a lot to just offer her something she likes. You can also work on teaching her fetch, showing her that giving up items is a good thing, especially if she already enjoys learning commands. Hey, My dog Arya that we got a few weeks ago shows aggression with her bones. My family member bent down to oet her and she barked and bit him, making him bleed. She has been growling at me a lot even when she doesn’t have the bone. It scares me to go near her and i don’t know how to fix this problem, any ideas..? I’m so sorry to hear you’ve having resource guarding issues with your dog, Rebecca. Since he has already bitten severely enough to break skin, it’s imperative that you work with a professional behaviorist to get to the bottom of these problems. Attempting to fix this yourself at home can potentially make things worse, and you don’t want to end up in the hospital or have to someday have him put down. In the meantime, always, always, always offer a tasty treat in exchange for what you’re trying to take if you MUST take something from him. Never try to practice by messing with his food, a lot of owners set their dog up for disaster and end up getting bitten. Ask your vet to recommend a trainer who is experienced with this. The book “Mine” by Jean Donaldson can also help while you’re working with a trainer, I’ve never read it but it’s highly recommended in the dog training community. High Lindsay, Thank you for your prompt response regarding issues with my dog Hunter! I followed up on you suggestions and found an organization called Bark Busters who deal with so many different issues of dog’s behaviors who also come to your home to help resolve your dog’s problems. Also will order the book “Mine”. My trainers name is Jessica with 5 star ratings. Will do a F/U with you to let you know how everything went. THANK YOU FOR ALL YOUR HELP!